For this project, we 3D printed a part that mimics the fibrous nature of wood using the Stratasys J750 3D printer. 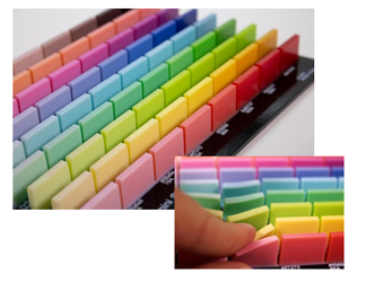 All parts that are designed as full-color models need the following material colors: VeroBlack Plus, VeroMagenta Vivid, VeroCyan Vivid, VeroYellow Vivid and a white component which is typically VeroPureWhite. We need to include the white material in our design since we are printing into empty space, not onto white paper, and without the white medium, our result would be either transparent or too dark. 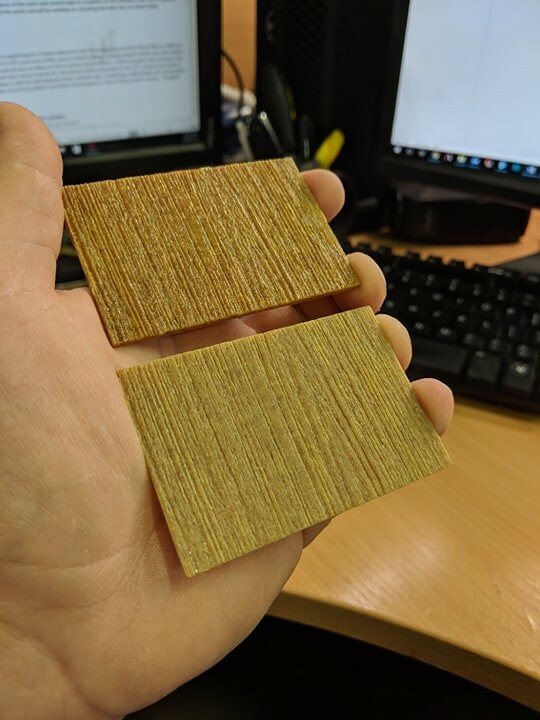 When we want to imitate a material that has some softness to it (in this case wood) we can swap the rigid VeroPureWhite for our simulated rubber-like Agilus30 White. GrabCAD Print, the printer slicing software used to print the project, will automatically fill the parts with the same amount of Agilus30 White as it normally would have with VeroPure White, but the result will be a surface material with a ShoreA value. Typically, lighter colors will be softer than darker/richer colors. This combination makes Agilus30 White the perfect medium for creating textures that feel closer to a real product than ever before. How do We Make a Texture File? In both SOLIDWORKS and Adobe Photoshop CC, we can create 3D extrusion textures using greyscale bump maps. It’s easy to find bump maps for simple textures, such as diamond knurling, herringbone or spheres, but sometimes the bump map you're looking for either doesn’t exist or doesn’t have a color file associated with it. That’s not a problem! Using Photoshop, it’s easy to desaturate the color image you want to use and adjust the brightness, contrast and levels to get some great white/black regions, along with what will end up being some average height grey areas. From there, we can apply this bump map to a surface in SOLIDWORKS and use the 3D Texture feature to extrude the textures from the surface. If we don't want to use SOLIDWORKS, we can also have Photoshop do a similar function converting the image from 2D to 3D. 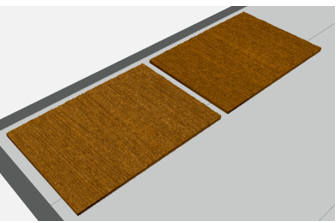 Once we have a 3D texture file, we can pull the part into Photoshop to wrap the model with the original color image and export it as a VRML using the J750 color and resolution settings that already exist in Adobe Photoshop CC. Setting up a full-color Agilus30 White print in GrabCAD Print is easy. First, make sure that you have all five required materials loaded and a 6th material of your choice (we usually use VeroClear in this spot). Doing so will allow GrabCAD Print to open with the currently loaded materials on the printer, which will save you from having to change the material pallet to setup, making things a bit easier. From there, you can click “Add Models” and add your VRML file, which will open in full color on the tray. Once the print is completed remove the parts from the tray, clean off any support using your Waterjet and you’re all done! Using a combination of SOLIDWORKS, Adobe Photoshop CC and the Stratasys J750 PolyJet technology brings your conceptual model to life. Following this process can really help give people outside of the design team a great impression for what your final product is going to look and feel like. Spending the extra time to create final production part texture and printing it with Vero colors to achieve full color and Agilus30 White to achieve the final tactile sensation is absolutely worth it! Are you interested in learning more about the Agilus30 material? Click on the button below.